Excel 2016 makes it easy to download pictures from the web using the Bing Image search engine and insert them into your worksheets. To download an image with Bing Image Search, open the Insert Pictures dialog box (Alt+NF) and then select the Search Bing text box, where you type the keyword for the types of images you want to locate. After you press Enter or click the Search button (with the magnifying glass icon), the Insert Pictures dialog box displays a scrollable list of thumbnails for images matching your keyword. You can then click a thumbnail in the list to display a short description plus the size (in pixels) of the image in the lower-left corner of the Insert Pictures dialog box. Selecting a web image to download into your worksheet. 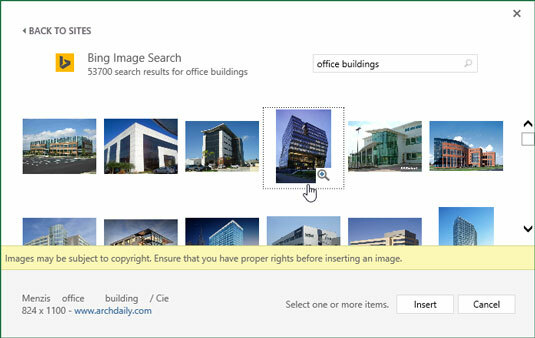 Below the top row of thumbnail images, the Insert Pictures dialog box also displays a disclaimer informing you that the online images that Bing has returned in the search use what’s called Creative Commons. This licensing grants free distribution of what is otherwise copyrighted material under certain conditions (often noncommercial or educational use). The disclaimer then goes on to urge you to review license for any image you insert into your worksheet so that you may be certain that you are in compliance with these conditions (always a good idea). After reading this disclaimer, you can close its text box by clicking its Close button with the x in it. To get a better view of a particular image whose thumbnail is highlighted or selected in the list, click the View Larger button that appears in the thumbnail’s lower-right corner (with the magnifying glass with a plus sign in its icon). Excel then displays a slightly larger version of the thumbnail in the center of the dialog box while at the same time blurring out all the other thumbnails in the background. To insert one of the located web images into the current worksheet, double-click its thumbnail if it’s not already selected in the list. If the thumbnail is selected, you can insert the image by selecting the Insert button or by pressing Enter. If you use a social media site such as Facebook or the photo-sharing site Flickr on your Windows device, you can add these locations as options to your Insert Pictures dialog box (shown here). Simply select the app’s icon that appears at the bottom of the Insert Pictures dialog box to connect Office with the particular app. You can then insert images from one of these sites after selecting its option in the Insert Pictures dialog box. You can also download pictures saved in folders on your OneDrive by clicking the Browse button to the right of the OneDrive heading at the bottom of the Insert Pictures dialog box.